Get live alerts for incoming rain or snow. 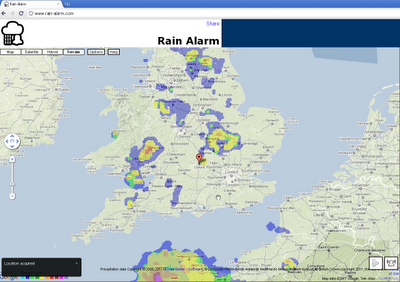 The simple idea of this web map and app is to warn you against approaching precipitation like rain or snow. Therefore the app checks in a perimeter of 75 km / 47 miles every 30 minutes, if there is something approaching. Simply leave the page open in the background and you'll get notified. Note that the map is refreshed automatically so you do not have to reload the page. The buttons on the bottom right en- or disable the animation and the alarm functionality. The data used originates from governmental weather services and is available for the USA, Canada, Australia, the UK, Ireland, Norway, Germany, the Netherlands, Spain including the Balearic and the Canary Islands. The alarm notifications work best with Google Chrome. For Mozilla Firefox and Microsoft Internet Explorer the alarms work as well, though they are not as pretty and intuitive. With some browsers your location can be determined automatically or otherwise a rough estimate is used. To correct your location, simply drag the marker to be able to receive correct alarms. You need to keep Rain Alarm as the active tab to be able to receive alarm notifications even when the Internet Explorer is minimized. The app is also available for Android as well as iOS.